December is a fun time of year for us. Homes are lit with snowflake lights and the weather has dropped low enough for us to have an actual snowfall, which means it’s also time for people to create unique paper snowflakes at Weasel Boy. The tradition began when a former employee, Wilma Lawn, answered a customer’s question about making snowflakes by giving the person paper and scissors and showing them how to do it. Since then, people make snowflakes every year that decorate the brewery windows through the end of February. 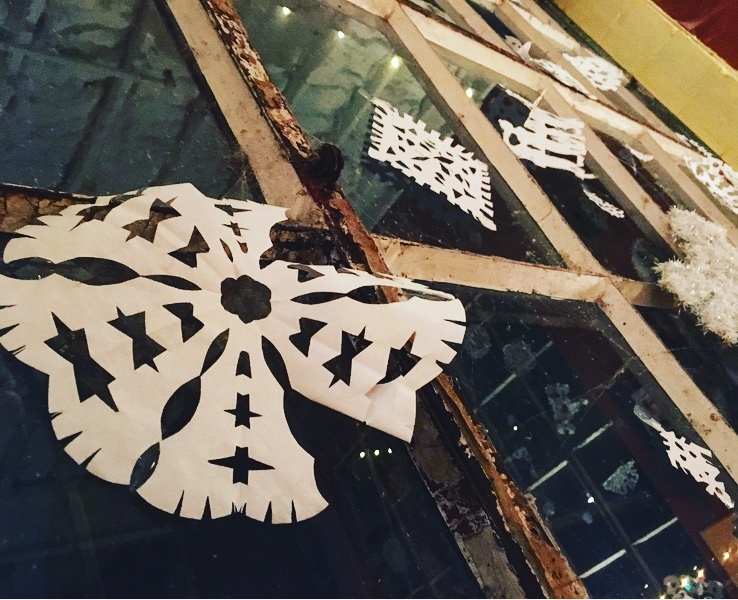 We provide the paper and scissors and bartenders are glad to tape the snowflakes to the windows so customers can show off their delicate creations. Some people do one every year and there always is at least one person who doesn’t think their snowflake is worthy of the windows. Usually, they try to throw it away but most never hit the trash can. We feel strongly that every snowflake, no matter what shape or style, should be put up. Take a look next time you’re in and you’ll see a variety of shapes and sizes and patterns and they all look amazing on the windows. We hope you will take time next time you’re in to make a snowflake while you’re enjoying you next pint of Weasel Boy. Cheers!